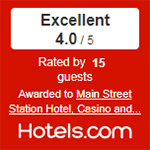 Come see why Main Street Station Casino Brewery Hotel may be the best-kept secret in all of Las Vegas! With a charming Victorian-era theme, dozens of rare antiques and curiosities, award-winning restaurants – and even a slab of the Berlin Wall – Main Street Station offers a unique experience you won’t want to miss. View our latest hotel offers and room packages. Our rooms & suites are prepared for your arrival. Be a part of Downtown Las Vegas’ renaissance. You’re sure to enjoy your stay at Main Street Station. The perfect place to stay in Las Vegas. Be close to all the action of Downtown Las Vegas. Combine Victorian elegance with modern convenience. Enjoy the comfort and convenience of modern times in our beautiful Deluxe Suite. Learn about the history behind our well-known name, firm, and people! Exclusively for B Connected Members! Room Offers & Special Discounts - Remember, It’s Good To B Connected! Our resort amenities are all designed to make your stay more comfortable. Bask in the sun or take a swim. Hotel guests can find a delightful refuge at the Cal’s beautiful swimming pool. Take our shuttle to explore nearby locations! Our shuttle service takes you Sam’s Town, and from there to the Strip. Travel with us for discounted rates. Discounted rates at all Advantage Car Rental Locations in Las Vegas. Make your stay more comfortable. Our guest services are all designed to make your stay more comfortable. Take a self-guided tour through history when you visit Main Street Station. If you’re looking for rooms for a group, we can accommodate your needs. If you’re staying at Main Street Station as part of a group, enter your group reservation code at the link below to book your room. We understand. Life happens. If you need to check on or cancel an upcoming reservation, log in to view your reservation below. 30% off Room Rates Spring Break Sale!